What is Hub Site in SharePoint Online? 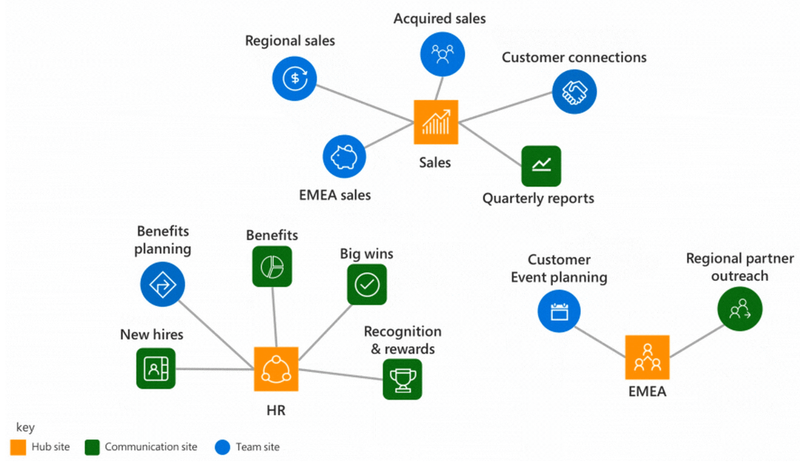 Hub sites in SharePoint Online is a new way to organize related sites together into centralized portals based on organizational attributes such as project, concepts, team, department, division, region, etc. A hub site can have both modern team sites and communication sites associated under it. Hub sites provide common navigational structure, look and feel, Logo and search across associated sites. Consistent look and feel - All sites associated, gets the branding from hub site. Logo and theme of the hub site pushed to all underlying sites. This allows you to maintain a consistent look and feel across your sites. Scoped Search - If you search within the hub site, It searches for content on the current hub site also within all the connected sites and displays the search results page. Content Roll up - Automated aggregation and display of content from multiple sites: Consider the scenario that you are rolling out department intranet sites, and want a single landing page where the entire organization can see a roll up of the announcements from each department all at once. News web part, sites web part and highlighted content web part can be utilized in hub sites to get aggregate content from all the associated sites and display the roll-up on the hub site's home page. How to Create a Hub Site in SharePoint Online Admin Center? Click Finish to create the site. Click on the check box next to the site that will become a hub >> Click on "Register as Hub Site" from Hub Site menu. Fill in the name of the Hub and click on Save. You can convert existing Sites to Hub Sites, but sites that are already associated to another hub can't be converted to a hub site. To make the site as Hub Site using Power Shell script, Make sure you have downloaded and installed the latest SharePoint Online Management Shell first. If you already have a previous version of the shell installed, uninstall it first and then install the latest version. It will prompt user credentials, give the credentials and connect to SharePoint admin site. If you need the Hub Site to be Unregistered, following PowerShell command can be used. You can revert hub site to team site or communication site from SharePoint Online Admin center as well. You can create up to 100 hub sites for an organization. There is no limit on the number of sites that can be associated with a hub site. 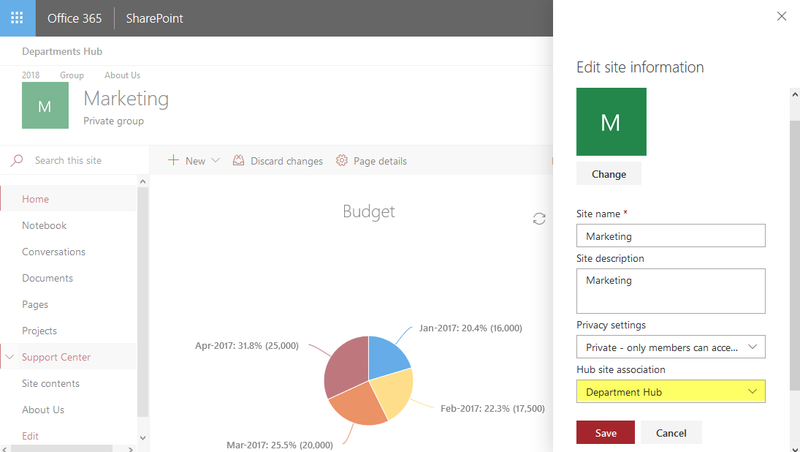 This enables hub site in SharePoint Online. Now we have the Hub Site is Ready! Change the Logo, Theme for the Hub Site based on your organization requirement. Also, edit the hub site navigation that appears on all associated sites. All sites associated with the hub site will inherit these elements. Please note, when you customize the hub site after associating with any SharePoint Online sites, it could take up to two hours for the changes to propagate in associated sites. 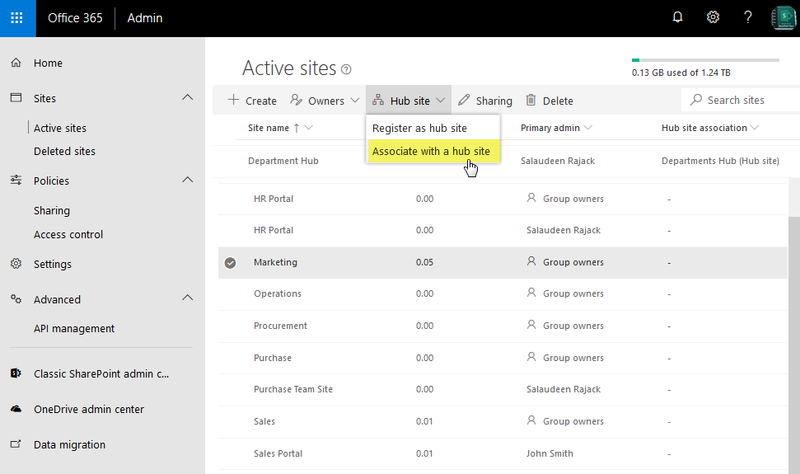 In SharePoint Online Admin Center, click on the checkbox next to the site collection you want to associate with the hub, then from the Hub site drop-down menu choose "Associate with a hub site"
from the list of all the hubs you have available in your tenant, choose one you want to connect to and click "Save". This sets the hub site association for given site collection. Please note, this technique only works for site collections that have been modernized! Once you connect the site with hub, Navigation, Theme and Logo will be applied to the newly joined site. 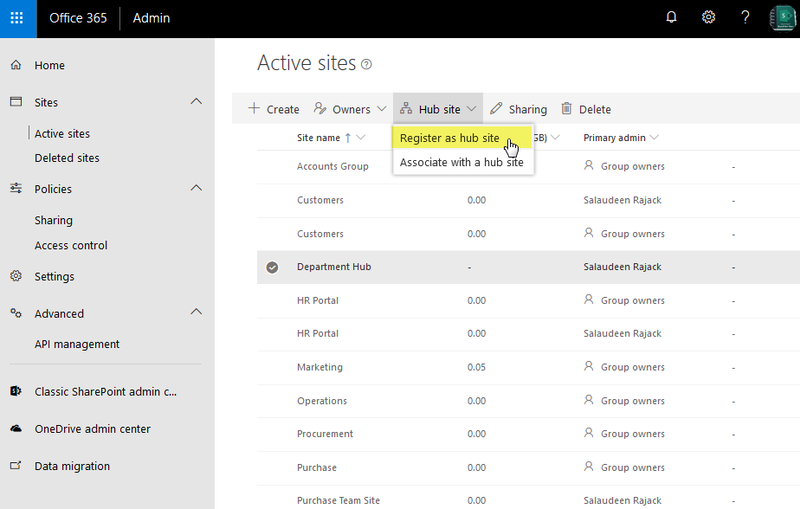 You won't be able to associate a SharePoint Online hub site in to another hub site. Also, You can't associate a site with more than one Hub Site. Click the "+" sign to add a new link. Associated Sites will automatically contain a link back to the SharePoint Online hub site. You'll also notice that you cannot change the theme of an associated site, since it will inherit the theme from the hub site. When users associate their sites with a hub, it doesn't impact the permissions of either the hub site or the associated sites. It's important to make sure all users you allow associating sites to the hub have permission to the hub. 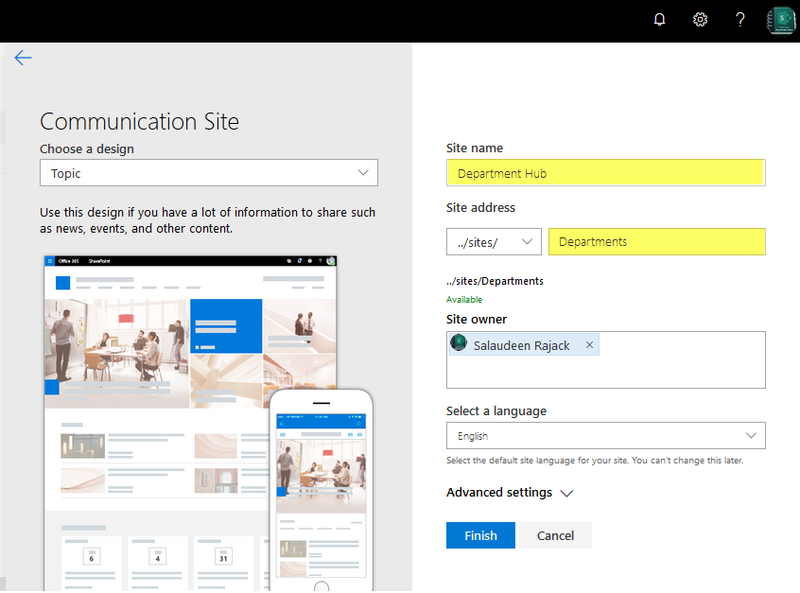 You can disassociate your site from a SharePoint hub site when the association is no longer needed. Doing so will remove the hub site navigation bar from the top of your site. The look that your site inherited from the hub site will stay the same and features such as additional navigation links, applications, or custom lists with specific columns that were added as part of the inherited hub site design will remain. To remove the existing hub site association, You can select "None" in Hub Site association drop down list and Save. It will remove the Navigation and logo, but it will not restore the original theme. We need to manually change the Theme/look and feel.